We’d love your help. 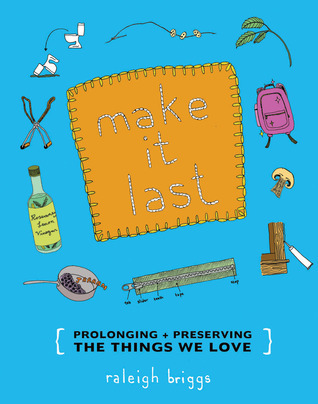 Let us know what’s wrong with this preview of Make It Last by Raleigh Briggs. To ask other readers questions about Make It Last, please sign up. Love it. A perfect collection of useful ways to get the most out of stuff and reduce overall consumption. While I had the good fortune to grow up with a 'depression-era' father who taught me many of the tidbits shared in this book, I think that many people don't have much of this basic info. This book would make a perfect gift for anyone heading out on their own for the first time! An essential for your bookshelf. Support indie artists and publishers and buy this book- you won't regret it. Great info. Very beginner-friendly. Illustrations are great. Useful book. Hand-lettered and nicely made. Very handy book to have on hand. Gives you the confidence to complete DIY home repair in a very non-intimidating way. Cute. I believe my standards of usefulness for 'how-to' books are quite high. Handy, accessible, and cute to boot. Really solid how-tos. I'll definitely be referencing this book on the regular as I try to learn more sewing skills in particular. Also when I have to change the wax ring on a toilet again. 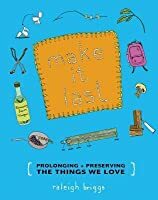 Raleigh Brigs is the best-selling author of Make Your Place: Affordable, Sustainable Nesting Skills and several DIY zines. She lives with her husband and two needy cats in Seattle, WA.